Dwarf of Thorin and Company descended from the Dwarves of Khazad-dum. Bombur was not of Durin's line. His brother was Bofur and his cousin was Bifur. Bombur wore a light green hood. Bombur was a fat, grumpy, and lazy Dwarf. Bombur and his brother and cousin were selected by Thorin Oakenshield with nine others to join the quest of Erebor. The goal of the quest was to reclaim the Lonely Mountain and its riches from the dragon Smaug. On April 26, 2941of the Third Age, Bifur, Bofur, Bombur, Thorin, and the wizard Gandalf arrived at Bag End. 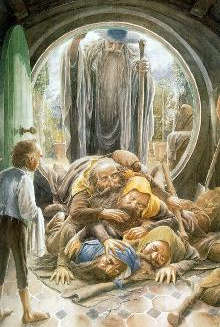 Bombur fell on Thorin when their host Bilbo Baggins opened the door. Over tea, Bombur played his drums. The next day, the Company set out on their quest. In the Misty Mountains, Bombur's size caused him to slow down when running to escape from Orcs. This escpecially cause problems when he had to carry Bilbo. At the house of Beorn, the Dwarves were to enter Beorn's house in twos. However, Gandalf told Bombur that he could count as two and enter last, but Bombur refused and entered with the last pair, making a group of three. When the Company was crossing the Enchanted Stream in Mirkwood, Bombur was chosen to cross last. As it turned out, Bombur fell into the stream and fell asleep, having a marvelous dream about food. His companions had to carry him through the forest for several days before he finally awoke. When the company became ensnarled in the webs of the Great Spiders, Bombur was the Spiders' choice to east first because of his shier size. Bilbo used Sting to ward off the Spiders. Bombur was too fat to climb up to the secret door of the Lonely Mountain, so he stayed behind with Bofur to guard the ponies. When Smaug emerged from the Lonely Mountain in a fit of rage, their cousin Bifur rushed to save his vulnerable cousins Bofur and Bombur, who were still outside during the attack. Luckily for them, Bard the Bowman shot down the dragon before he could kill anyone. Bombur and his relations all survived the Battle of Five Armies. They settled thereafter in the Lonely Mountain. Bombur was still living at the time of the War of the Ring, and his date of death is unknown. However, when Gloin saw Frodo Baggins at the Council of Elrond in 3019, he reported that Bombur was so fat that he could no longer walk and had to be carried to the table by six foot Dwarves. Bombur is the Old Norse word for "fat." The name Bombur appears in the Old Norse poem Voluspa.